Even the discount airlines need a rockin' safety video now. 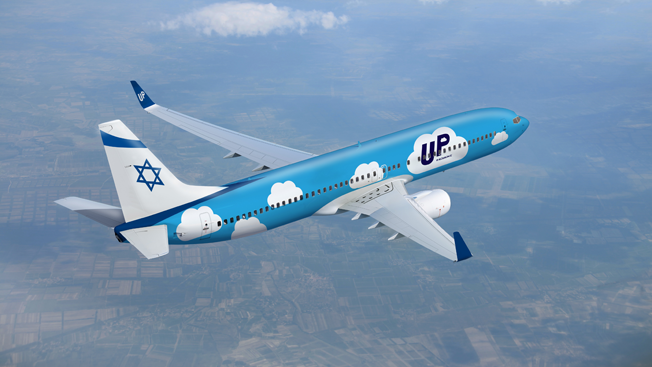 Get down with the latest in-flight jam, titled "Up," created for a new budget airline also called UP, owned by Israel's El Al. The jaunty boogie takes a five-minute scenic tour through some great moments in rock history, including Devo, Robert Palmer and Ziggy Stardust. Yes, they're jumping on the flight-video bandwagon without a unique take like Air New Zealand's bikini models or Delta's attack of the killer scrunchies. In fact, it's rather similar to Virgin's "Safety Dance." But that doesn't make it less charming. In general, informational videos forced on a captive audience should be applauded for any attempt at edutaining us. And the afros and cottonball cloud costumes are certainly working here. Plus, you gotta love a good keytar.